We represent more than 75,000 airline employees including mechanics, customer service agents, reservationists, simulator technicians, ramp agents, stock clerks, dispatch personnel, flight attendants and pilots. The Airline Division of the Teamsters Union continues to negotiate some of the best contracts in the industry, making Teamster contracts and membership the best choice for airline-industry employees. 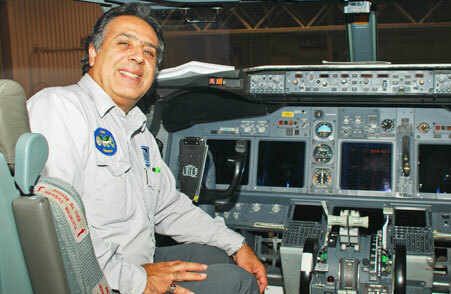 As the only labor union that represents every craft of workers in the airline industry, the Airline Division has grown steadily since its first organizing drive in 1961 at Western Airlines. Today, Teamster contracts in the Airline Division focus on raising airline industry standards, promoting safety, educating members, fighting outsourcing and securing the careers of our members. Under the direction of Captain David Bourne, the Teamsters Airline Division has focused its efforts not only on giving our members a voice in the workplace and in Washington, but also on being a voice for the American traveling public. Since taking over as Division Director in 2008, Captain Bourne has personally held more than 200 meetings on Capitol Hill and fostered numerous others with Airline Division local officers to raise awareness about the issues affecting airline industry employees with our nation’s politicians. Working closely with other airline industry labor unions and groups, he has been a leader in forming an airline industry labor coalition. This coalition—a historic first in the airline industry—represents the interests of more than 160,000 airline-industry union employees and the entire American travelling public who fly on U.S.-registered airliners. The Teamsters Airline Division has taken a strong position on maintenance and safety issues. By standing up and speaking out against the use of low-cost, substandard and poorly-regulated maintenance facilities, the Airline Division is recognized as one of the leading experts on Capitol Hill for ensuring that passenger aircrafts are properly maintained by facilities that only use FAA-licensed mechanics and technicians. It is the goal of the Airline Division to ensure that maintenance facilities that service U.S. aircrafts are held to the same high standards for security and skills that airline facilities in this country must maintain. To help propel our fight against outsourcing, the Teamsters Airline Division, in conjunction with the Teamsters Aviation Mechanics Coalition, has devised an Outsourcing Defect Report to document and catalogue faulty repairs made by foreign MRO stations. This report can be filled out by both members and non members and its data is reviewed by qualified members and stored in a databank accessible by certain Teamster reps when needed. No airline should be allowed to use the cloak of bankruptcy to violate legitimate contracts with their employees, passengers and vendors. The Airline Division has been working diligently with Congress to overhaul key provisions of the bankruptcy code. The Airline Division is also focusing on legislation to hold airlines more accountable and less able to protect the wealth of management at the expense of employees and the traveling public. Our record is clear. We are the only union in the airline industry that has grown by 30 percent during the past two years. More and more, key industry leaders turn to us for solutions and every day employees seek us for our solid reputation and strong representation. For our members and the American public, we pledge honesty, integrity, unity and a voice on Capitol Hill that is second to none. That’s who we are as Teamsters: We are proud to be the voice for American working men and women and the traveling public.